To choose the scoring method, select Switch Scorepad #/+ in the menu. This is one of the most requested options from ScoreKeeper users. Thank you for the feedback! You can send us feedback by selecting About/Feedback in the menu. The completely redesigned ScoreKeepr v3.0 is now available in the iOS App Store and Google Play Store for Android. 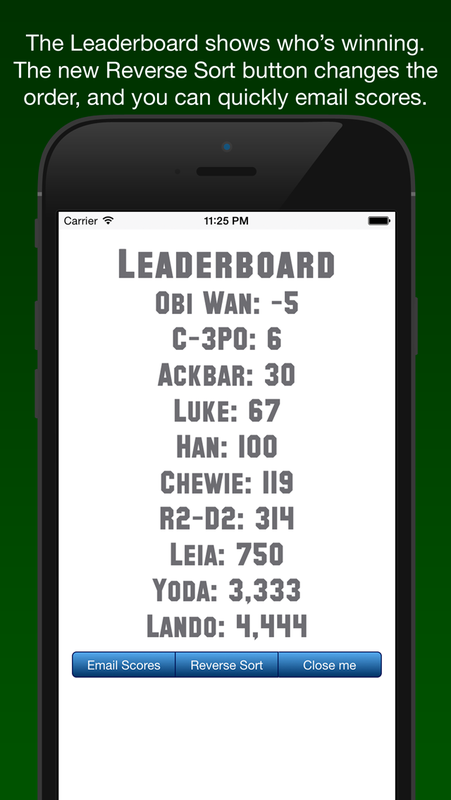 New features include support for up to 99 players and 99 rows, a sortable Leaderboard, and new animated backgrounds. Starting a New Game, adding/removing players and rows, changing the font, font size and background, and other commands are all in the left side slide out menu. All saved games are listed in the right side menu slide out menu. 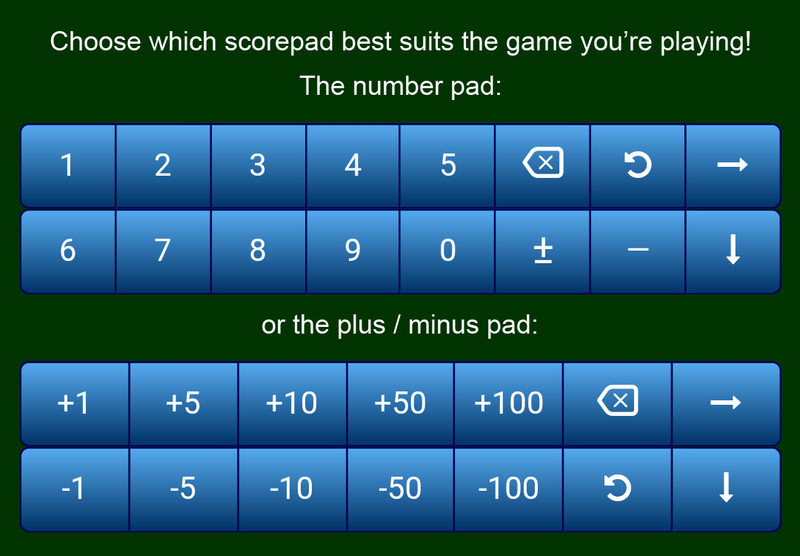 Score entry is completely redesigned with a numeric keypad, instead of the previous method which used set increments like +1 +10 +50 etc. This was a highly requested feature. Also new are the right arrow → and down arrow ↓ buttons to speed score input. You can also tap on the score you would like to change. Thank you for the feedback and votes to choose the final design! We’re looking to update the company logo, and are running a design contest over at 99designs. Your feedback would help a lot! Click to vote for your favorite design. Contest runs through Monday, April 20, 2015. Thanks for participating! Making it into the rankings in the iOS US App Store is hard. There are many large, well funded companies making apps for iPhones and iPads. 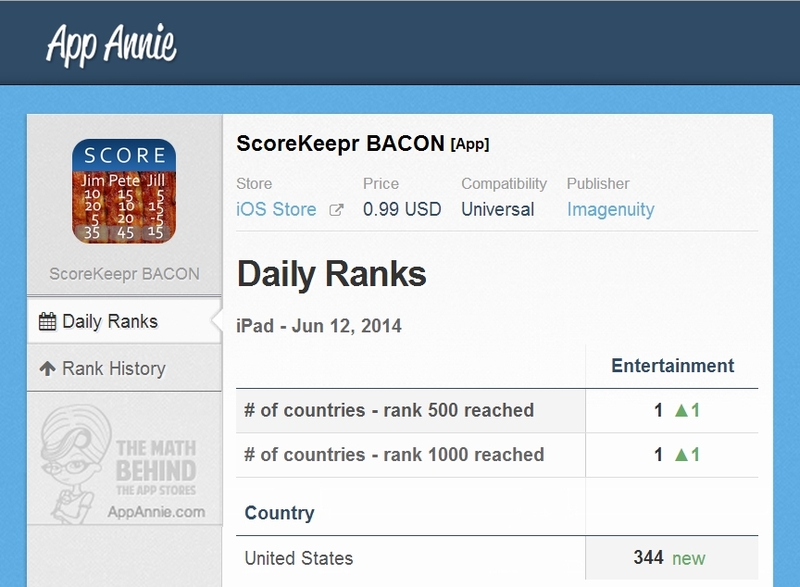 I happy to announce that ScoreKeepr BACON just ranked #344 in the US iOS App Store in iPad Entertainment. This is the first time it ranked in the top 500‬ or top 1000. 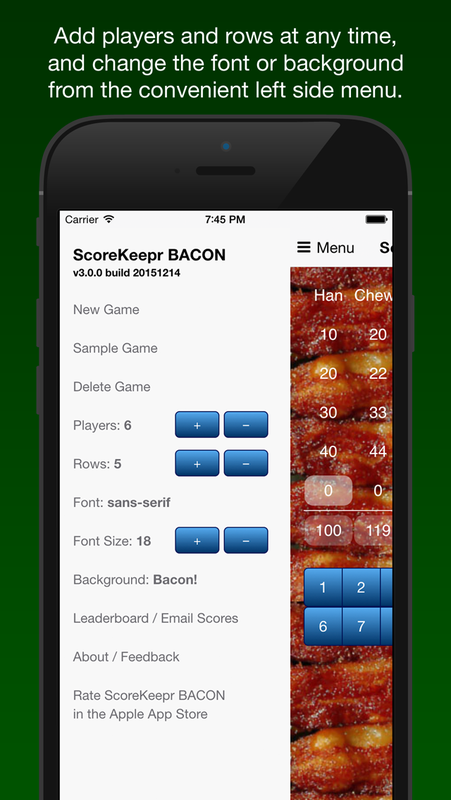 And especially a big THANK YOU to everyone that purchased ScoreKeepr BACON! ScoreKeepr BACON half off to support #TableTopDay! This weekend (April 5th-7th), ScoreKeepr BACON is half off to celebrate and support #TableTopDay. ScoreKeepr was built to provide an easy way to keep score for enthusiasts and fans of tabletop games of all kinds: board games, cards, dice, dominoes and more. So find a group or get your group together and PLAY MORE GAMES! ScoreKeepr BACON 2013 Holiday Sale! 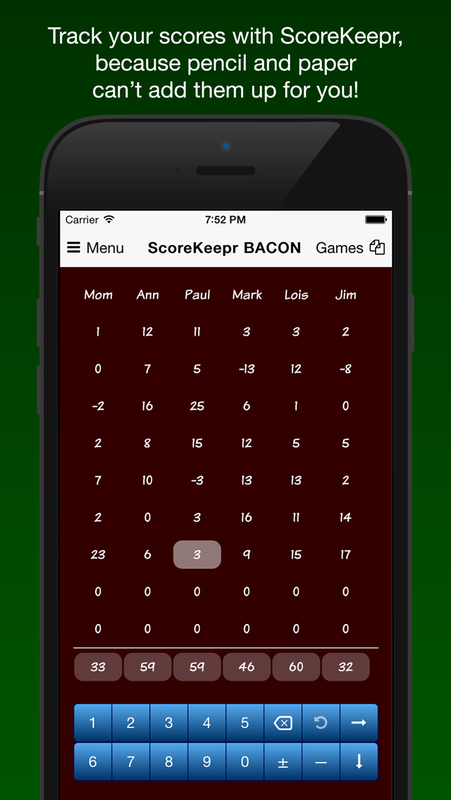 ScoreKeepr BACON is 0.99 cents through January 1st. Track scores for up to 10 players and easily email the results. Available for iPhone, iPad and Android phones and tablets. ScoreKeepr BACON half off this weekend! 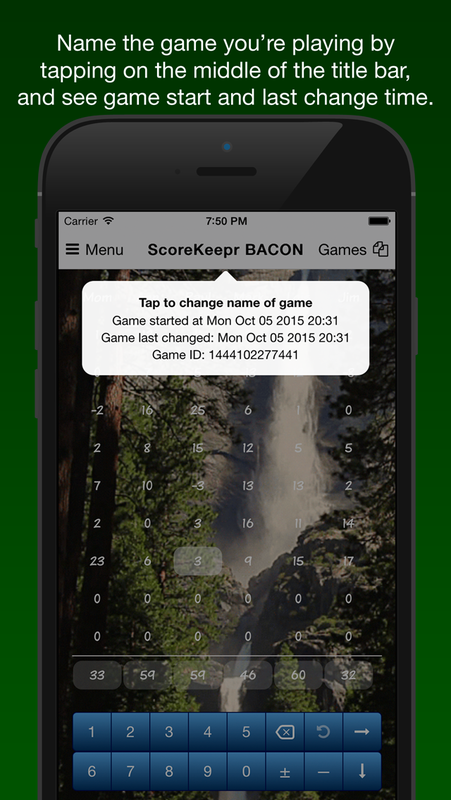 This weekend only (through March 31st), ScoreKeepr BACON is half off! We’re excited and are celebrating the launch of our new website, and we also to want to support #TableTopDay, the new holiday for playing table and board games on March 30th. See http://tabletopday.com for more info. UPDATE: The Google Play Store is giving me problems, and won’t update the price to the US$0.99 sale price. Sorry for the inconvenience! I’m trying to get Google Developer Support to fix it for me. The majority of the internet community is taking a stand against SOPA/PIPA which attempts to fight copyright infringement through Internet censorship, and bypass the due process of law by allowing alleged copyright infringers to be forcibly taken offline without a trial. Many internet companies have stated their opposition to SOPA/PIPA, such as Google, Reddit, Facebook, Twitter and Wikipedia. An excellent analysis is here on Reddit. To be clear, this is NOT objecting to copyright law, and NOT in support of copyright infringers. On January 18th, many websites around the world are blacking out to protest this poorly thought out and technology ignorant legislation, before it is voted on by the US Congress and Senate. 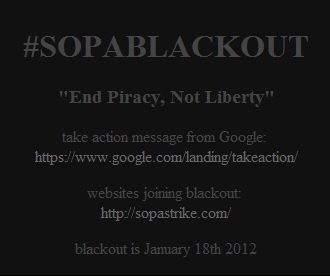 Imagenuity is participating in the protest of the SOPA and PIPA, and will take part in the blackout movement from 12am PST to 11pm PST on January 18th.